A queen honey bee's life lasts between a year and five years. A queen bumble bee lives only one year. Both honey bee and bumble bee queens' life spans depend on their ability to produce offspring -- they die when they are no longer able to lay fertile eggs. Honeybees rely on a single queen for reproduction. They inhabit a hive from year to year, hibernating there during winter. The queen is protected in the safety of the hive for all but one time of year, when she embarks on her mating flight. She makes this journey annually to mate with drones from other bee colonies. When she returns, she lays the eggs for her hive, which become drones, workers or queens. If the queen is unable to mate during her window of opportunity, all the eggs she lays are infertile and develop into drones. Drones are important to the hive, but they aren't able to collect pollen, produce honey or make honeycomb. 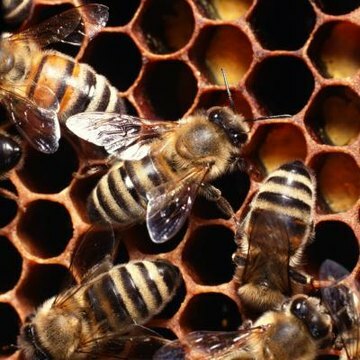 Without new worker bees, the hive suffers -- with fewer worker, the queen receives less royal jelly, her primary food source, which shortens her life span. New queens are allowed to live based on one of three scenarios -- the existing queen has gone missing, most likely during her mating flight; the existing queen's egg production has slowed; or a new hive is to be formed with the new queen leading it. If the reigning queen does not return to her hive after a mating flight, queen larvae are reared until one is able to take the missing queen's place. Existing queens sometimes abandon their hives when a new queen is reared, and sometimes new queens leave the hive to establish their own colonies. This is called swarming, and it happens when the current colony, or swarm, has outgrown the hive's confines. When the queen's egg production slows down, the worker bees begin to nurture specific larvae as potential new queens. Female larvae destined for the throne are served large amounts of royal jelly, or honey with exceptionally high sugar content, by the drones. In comparison, the workers eat less food with a lower sugar content. The reigning queen chooses between killing her future-queen offspring or allowing them to develop and become hive leaders. If the current queen allows the new queen to live, the old queen flees the hive with a following of loyal followers, allowing her successor to take over. The old queen must then establish a new hive, where she will live out her remaining years. Among bumblebees, the queen is the only colony member to survive winter. In the spring she awakens from her resting state, called diapause, and goes out in search of a nesting site. Once she establishes a nest, she lays eggs using sperm she stored in her body from males she mated with the previous year. The queen nurtures her larvae until they develop into adult bees, who take over young-rearing duties for the queen so she can resume full-time egg laying. The queen produces offspring throughout the spring and summer. In late summer she produces drones and new queens. The drones and queens mate, preparing for the next generation of bumble bees. When winter arrives the original queen dies and the new queens enter diapause. The Biology of the Honey Bee: Winston, Mark L.